Wooden toys may seem like an old-school kind of toy that maybe our grandparents used to play with, but more and more parents have started to see the benefits of these simply amazing toys for their children. Most importantly, wooden toys tend to be geared towards helping children to learn and complete developmental activities and can dramatically help to improve skills like hand-eye coordination, levels of creative thinking and, of course, their imagination, which is why I love these toys so much. To help get you started, I’ve sourced and selected some of my favorite wooden toys that are available today. All of these toys have been proven, time and time again, to be educational, functional and, of course, entertaining for your kids. 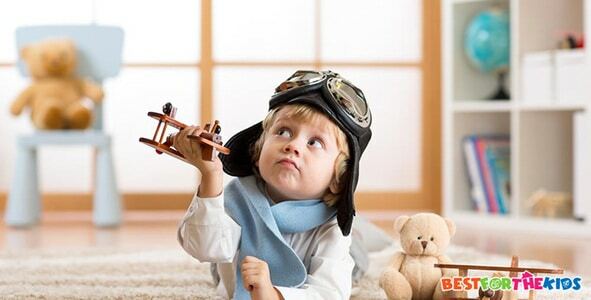 Why Choose Wooden Toys Over Any Other Material? To start with, I’ve chosen this awesome little play bench that your kids are going to love. Try to think of a time where your kids don’t love hitting something… I bet you couldn’t think of one. Fortunately, they can use this toy to express their pent-up energy on something durable and constructive. Made by the leading child’s toy brand, Melissa & Doug, you and your children can enjoy this deluxe pounding set which gives you everything you could possibly want. For example, each part of the bench that gets hit is individually color-coordinated, so your children can learn all about colors while they play. As the title suggests, the set includes the essential wooden hammer that your children will need to hit each of the little targets. As your child hits one target, the parallel target will pop up simultaneously, resulting in endless hours of fun and games that your kids will love. What's Great About It: I simply love the fact that despite how simple this toy is, it can be used as a great way to improve your child’s hand-eye coordination and their fine motor skills, making it perfect for this developmental stage of your child’s life. There is no such thing as a child that doesn’t love to throw their own tea parties. Whether they’re playing with their friends, their siblings, you, by themselves or with their beloved cuddly toys, a tea party is always a winning way to spend an afternoon. With this beautifully made wooden tea set from Plan Toys, your children will be able to enjoy the very best in luxury and imaginary tea parties that are quite possibly the most realistic they have ever been. With this set, you’ll find a collection of two cups, saucers, spoons and a gorgeous wooden kettle for mixing it all up. There are also two colorful tea bags to go in each cup. 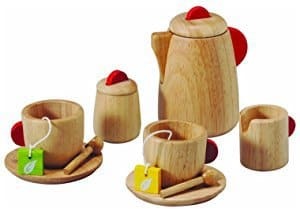 What's Great About It: The best bit about this wooden tea set is Plan Toy’s attention to detail when it comes to saving the planet. During production, a ton of measures have been taken to ensure that the wood is recycled and reused, helping to save on waste wherever possible. All of the wood has been taken from sustainable rubber tree sources, so the impact on the planet is minimal. This wooden toy is one of my absolute favorites. This is because it doesn’t just contain wooden materials, but it is also has beautiful colored plastic windows. 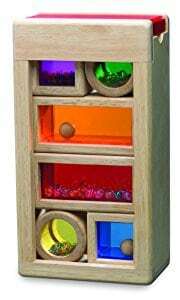 These windows divide the toy up into six unique shapes and compartments. Within these compartments, your children will be able to play with a bunch of different elements including free-rolling balls, a load of glitter and sequins, and also a compartment full of marbles. If you’ve ever heard or played with a rainmaker toy yourself, you’ll have a similar idea to the sort of sound effect that this toy can make, guaranteeing to keep your child’s interest for hours. 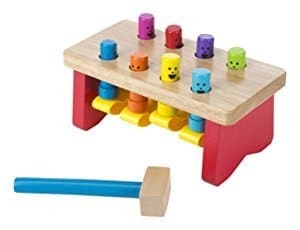 What's Great About It: What makes this wooden toy really special is the fact that your children can take off one end of the toy so that all of the internal pieces are free. Your kid can then rearrange the colorful sections anyway they please, allowing for a lot of color-specific games or simply for boosting their creativity. Children love to build things – that’s a given fact, which is why building blocks, whether designed for children or the form of Mega Bloxs and Lego, have stood the test of time and still remain some of the most popular toys around. However, especially for babies and toddlers, the pieces of these sets can be far too small and can become a serious choking hazard. 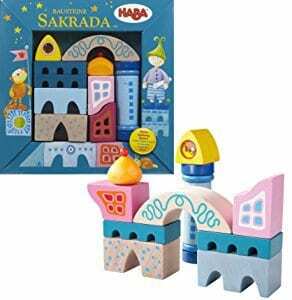 Instead, parents are advised to opt for sets that have larger pieces made of wood, such as this building block set from HABA. With this 10 piece set, your children will be able to use their own creativity and imagination to build any kind of fort, castle or palace that they like, resulting in countless hours of building fun and games. What's Great About It: I personally love this set because it teaches children all about structure and how things work. It also greatly helps to improve their hand-eye coordination, a benefit that you’ll notice almost immediately. If they don’t stack a block properly, the structure will fall, which further developes their problem-solving skills. Music is one of the greatest ways to entertain a child. Goodness knows that my children love to have a little boogie when their favorite tracks come on at home or in the car. This was when it occurred to me to get them a toy, or an instrument, where they could make their own music. 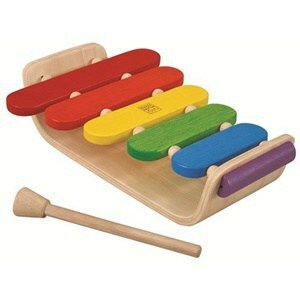 That’s when I stumbled upon this cool little xylophone from Plan Toys. This beautifully made xylophone is made with a gorgeous curved base with five, uniquely and individually colored notes that can be played with the little hammer which is included with the xylophone. In all, this is a great toy which will entertain your children for many hours, and can also help them to learn all about music whilst teaching them about different colors. What's Great About It: Just like many of the wooden toys on this list, this is a great way to develop your child’s hand-eye coordination skills. When creating music, it’s all about hitting the right notes at the right time, a rewarding challenge for your toddlers. When given to your baby, it’s a fun and safe thing for them to hit. No, there’s no risk of your child getting splinters through playing with a wooden toy, but they will get a lot of beneficial factors that you simply don’t find with other toys. Nowadays, children’s toys come in all different shapes, sizes, and materials. There’s plastic, metal, fabrics and pretty much any other material you can think of. So why should you choose wood in particular? There are two main reasons. 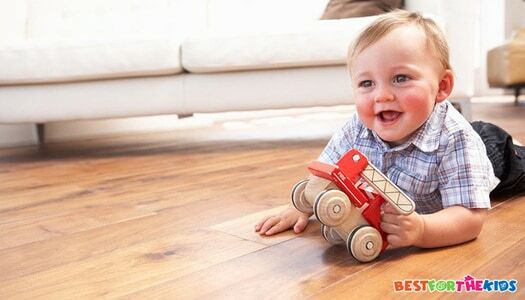 Firstly, wood is easily one of the most durable materials for a toy. When children are young and growing up, they like to hit things, throw things, chew things and push the durability of their toys to the absolute limit. I can see some of you thinking: ‘Yeah, tell me about it!’ If you’ve opted for a plastic or fabric toy, the chances are that it’s going to break within a few weeks of use. However, this isn’t going to be a problem when it comes to wooden toys. In fact, they’re designed to last for many years to come, and can often be used for many generations. The second reason is the fact that many toys these days are made out of plastic. This would be great, except for the fact that it’s been proven time and time again that these can be dangerous. Plastic materials are renowned for containing production-based chemicals, such as BPA and phthalates. These chemicals can be dangerous for any children who have prolonged contact with them. Studies have shown that these chemicals can cause growth problems and can cause issues with your children’s reproductive systems when they are older. This is not a problem you’ll have with wooden toys. As mentioned above, these wooden toys can last for many years to come. Not only will this save you money when it comes to buying toys, but it also means that your children will have these toys to play with for several years. This means that you get years of playtime from one toy since most of these toys can be used by children of any age. That’s a great way to give your children a toy that they’ll love, and they’ll never have to go without. So, if you’re looking for a safe and durable toy for your children to enjoy, you should definitely give a wooden toy a try.